This is the first comprehensive guide to substitutes for the lost 1890 U.S. Federal Census ever compiled. 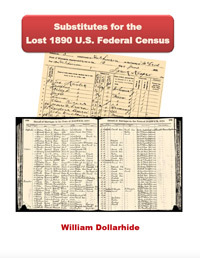 Written by researcher and author, William Dollarhide, this volume pulls together a listing of mostly online and quickly accessible sources to overcome the hurdle of the "gap" between the 1880 and 1910 U.S. Federal Censuses. This volume currently comes with a FREE PDF eBook download. Your book itself will ship by USPS mail.